The busier lives that people of this era are leading, it takes them months to take time out for themselves and relax for a while. The modes of chilling ad refreshing depend entirely on the person; some prefers to go on vacations while some people love to stay indoors and enjoy some family time. Also, some people like to read, invest time in recalling their hobbies or spending time doing what they love the most. Amongst all other options, the likes of going for a movie date with friends or family always stands the highest rated chance in and around the UK. People enjoy catching on the movie shows and love the outing that refreshes them for at least a day. But, in the British hemisphere, the era of clichéd movie halls has almost gone by and today people have adapted to the idea of outdoor cinema London that paves way for a better experience of movie musing as compared to the closed indoor cinema halls. 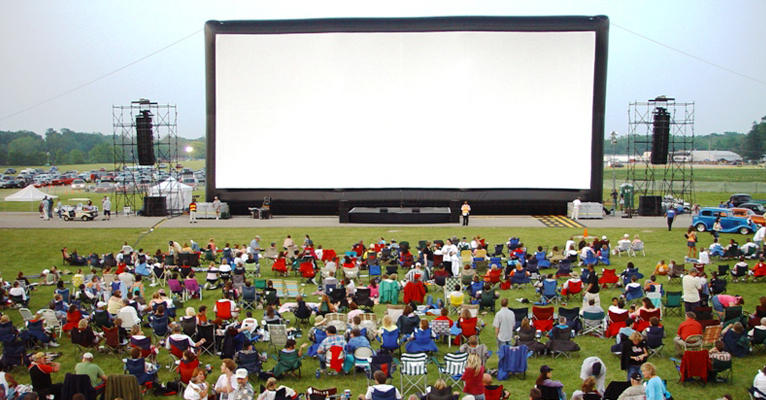 It is not that people don’t watch movies in the indoor theatres but many places across the UK have welcomed the idea of movie experience in the open and thereby made a place for outdoor cinema very ecstatically. Here, we are going to explore more about some of the best places in London which are superlative in offering us an experience of a lifetime for a movie date out with our friends and family. Talking about outdoor cinema in London and not starting with this one would put us to shame. As because this particular cinema does not only provide us with a movie viewing experience but also contributes its entire profit to the social cause. the amount earned through the screening of every movie on the summers are given away in charity and thus people in London prefer to go to this outdoor cinema as it serves a dual purpose for them. Well this one also features to be on the top of the list of the outdoor cinema experience in London because of it has a unique offering to its visitors- free entry to the opera! Yes, you read that right! This BP screens in the royal opera allow viewers to get entries for free and enjoy their offerings of the movies to an acknowledging wider audience base. What about a movie date with your partner with an impressive sunset view of the London skyline? Isn’t it romantic enough for you to reach the rooftop film club to watch a movie with the one who is close to your heart? Well, that is what this place serves its visitors besides the full bar of drinks, and the chocolates and popcorns to give you company on your movie date and a more amazing experience that one can have here is the option to choose silent cinema for the ones who love being all by themselves when watching a movie. You can go solo in your movie date with headphones on and nobody to disturb your peace during the show time. This is also a very popular go-to point for the outdoor cinema lovers; the ambience and the giant screen makes it all worth it. The larger crowds each year marks its popularity and it keeps growing more with passing times and better movie screenings. Sometimes it may happen that you want to see one film but the other family member wants to watch the other latest release. No need to worry in situations like these anymore; you have the Luna cinema which adjusts multiple shows to meet the needs of people with different tastes in cinema viewing. The open-air atmosphere makes it a more worthwhile experience for the cine-goers. The summers feel incomplete in London if people don’t go for the outdoor cinema experience to refresh themselves after the busy schedules of life. It is a getaway to beat the blues of life and happens to be a great outing with family and friends. The option of outdoor cinema hire is also available these days if you want to present yourself and your loved ones with a movie experience built right at your backyard or rooftop. A movie watching involvement along with your friends and family in a place which is comfortable for you and where you can enjoy yourself to the fullest is perhaps the best relaxing mode one can think of! Moreover, the best places in London which serve the high standard movie experiencing in the open are also a generous choice to hang out with the ones you love to spend time with; a happy you mean a healthy you!